Harris Tweed is having a moment. And it’s cropping up in the most unlikely places. First, the famous time-travelling Lord, Doctor Who, appeared in a Harris Tweed jacket on the show. This sparked a flurry of phone calls to the Harris Tweed authority with viewers begging to know what kind of Harris Tweed it was. Then came the slightly dubious trend of big manly beards paired with anything tweedy. The tweed is lovely. The big beards? Hmmm. In London, the annual Tweed Run continues to grown in popularity where men, women and children don their tweed and cycle around the capital. And at Chanel’s recent Spring/Summer 15 show in Paris, Lagerfeld’s models wore tweed, and even carried a placard declaiming, ‘Tweed is better than tweet’. 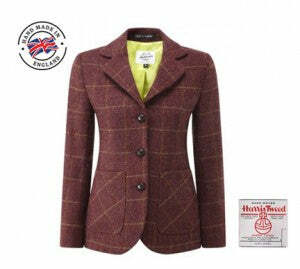 So now that tweed is definitely back on the fashion menu, let us remind you why it’s such a thing of beauty. The reason Harris Tweed is a ‘thing’ is not because of clever marketing. It’s because of the law. Because in 1993, the Harris Tweed Act was passed, meaning that only genuine Harris Tweed could bear the distinctive Orb trademark. This makes Harris Tweed the only tweed to be governed by its own Act of Parliament, and ensures that any tweed garment bearing the Orb is made to the highest standards. To qualify as ‘genuine Harris Tweed’ the tweed cloth must have been ‘hand woven and dyed by the crofters and cottars in the Outer Hebrides’, as it has been since the 19th Century. And self employed weavers still make the tweed in their homes on the isles of Harris and Lewis, as you can see in this short Youtube video And although the method of manufacture sounds impossibly quaint and old fashioned, modern demand for Harris Tweed is burgeoning. It’s not just in the UK that Harris Tweed is making a comeback. Exports to Japan account for around 40% of all Harris Tweed exports. The Japanese fashion connoisseurs value the fabric for its cachet, classic patterns and the attention to detail and craftsmanship that comes with any genuine Harris Tweed purchase. And where Japan leads, China swiftly follows. The Harris Tweed Authority reported recently that they are seeing ‘a very significant increase’ in enquiries from China. They’ve even had one of their leaflets translated into Chinese to help satisfy the thirst for knowledge about their iconic fabric. And where would the British Royal family be without Harris Tweed? The popularity of Harris Tweed first spread beyond the Scottish Isles thanks to the patronage of the Countess of Dunmore, Catherine Murray, who became an advocate for the material circa 1846. Using her influence and enthusiasm, she not only refined the production methods and quality of Harris Tweed, she also helped establish a London market for the material thereby increasing its popularity. And since then? The Royal Family has adopted Harris Tweed for hunting, shooting and fishing. This is due to the warmth and quality of the fabric and because the muted tones of traditional Harris Tweed are ideally suited to country pursuits. The British designer, Vivienne Westwood, is the doyenne of using tweed in haute couture, unveiling in 1987 her ‘Harris Tweed’ collection. She also famously designed a crown made from Harris Tweed. And other fashion designers have not been slow to follow in her footsteps; think Lagerfeld, McQueen, Ralph Lauren and Dries Van Noten. They’ve all brought tweed to the catwalk and as a consequence, to the high street. As Harris Tweed enjoys its moment, smart marketers have not missed the opportunity to broaden its appeal. And the range of goods that have been ‘tweedified’ keeps expanding. Think smart phone cases, wallets, headphones, cushions and furniture. Although Harris Tweed comes from humble origins in the remote Outer Hebrides, the passion it inspires in those who value quality extends across the world. And as the tweed revival goes global, it seems that we just can’t get enough of this soft, warm fabric exuding understated chic and timeless style. Shop now for Harris Tweed.